My kids were born in Vancouver, and have been mostly raised in Calgary. I love the Canucks and have learned to appreciate and cheer for the Flames, but my kids have other teams on their favorite lists. 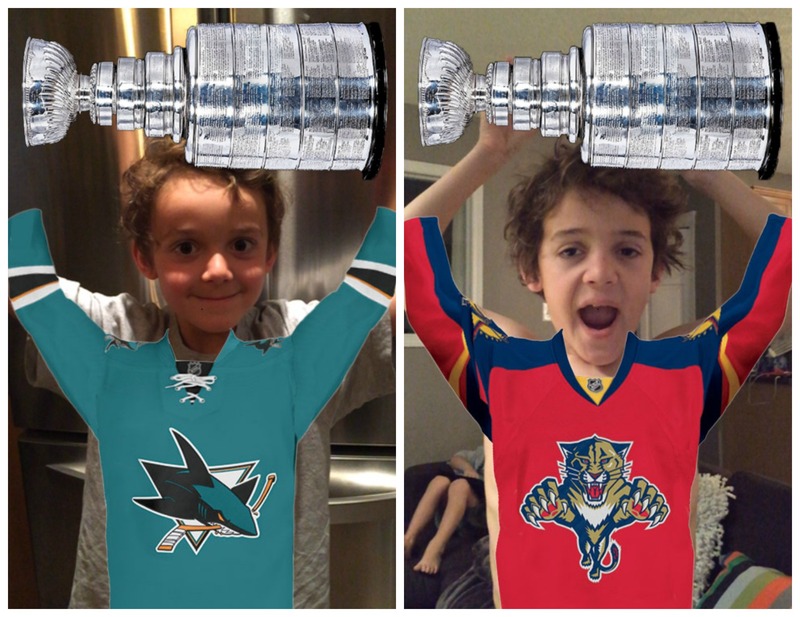 Somehow, in the past 18 months, they became fans of the San Jose Sharks and the Florida Panthers. For Zacharie, it was about the panthers that live in Florida. He’s a big animal lover and one of his favourite episodes of The Wild Kratts is about them releasing a panther back into the wild in Florida. We built our entire winter getaway last year around his love of animals and desire to see a real Florida panther. For Charlie, the affection for the San Jose Sharks is even more curious. Last spring I was asked by Subway to promote a Stanley Cup campaign where fans could cheer on their team. With no Canadian teams in the playoffs, I listed off all the choices for Charlie and he picked .. the San Jose Sharks – likely because of the shark aspect of it. Then the San Jose Sharks made the Stanley Cup Final and, well, Charlie is now hooked on the team. It was his turn to pick our winter escape this year and asked if we could go to San Jose. I don’t really think San Jose, CA is that much of a tourist thing for a family to escape winter, so I twisted his arm to accept San Jose del Cabo as a reasonable substitute. He’s game and has already packed his Sharks hat. 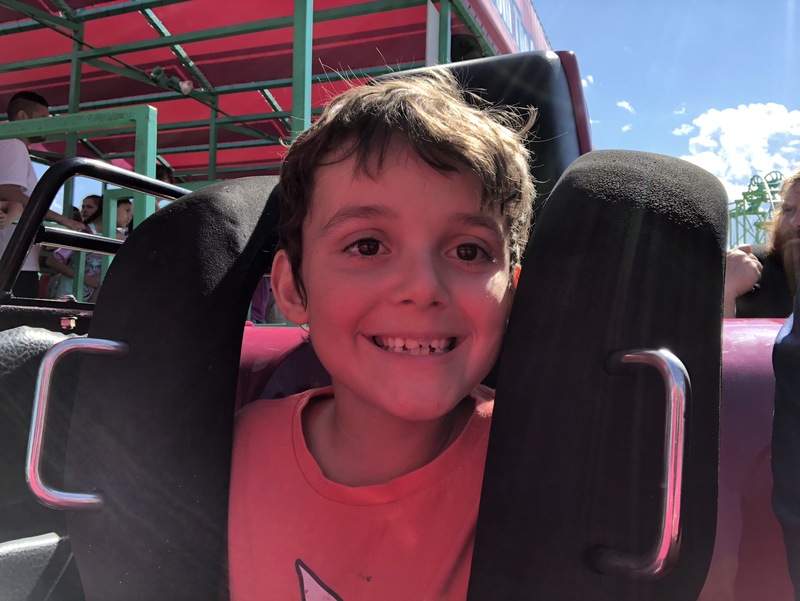 Charlie also made mention of the fact Zacharie got to see the Panthers when we went to Florida and asked if he could see the Sharks. 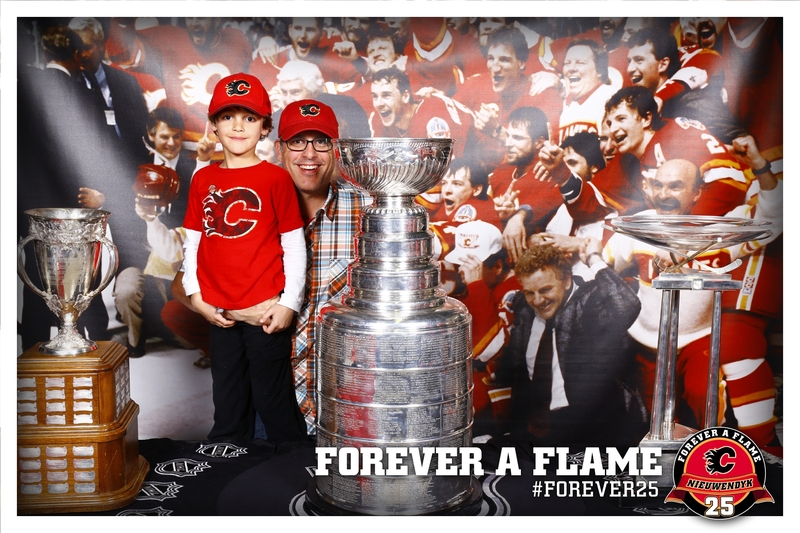 And that’s how I found myself online buying Christmas and birthday hockey tickets for my boys to see their favourite teams face off against the Flames here in Calgary. We got there too early. Charlie’s game was a school night 730p start. My idea was to get there and enjoy some of the pre-game warmup and then cross my fingers he’d make into the second period. Even if we had to leave early, we’d have had a good night out at the big arena, so we went early. I had to convince him for 20 minutes to sit by the glass and wait for the players to come out for warmup. Once they did come out, Charlie stood by the glass, marveling at “Big Joe” Thornton, his favorite player on the team. 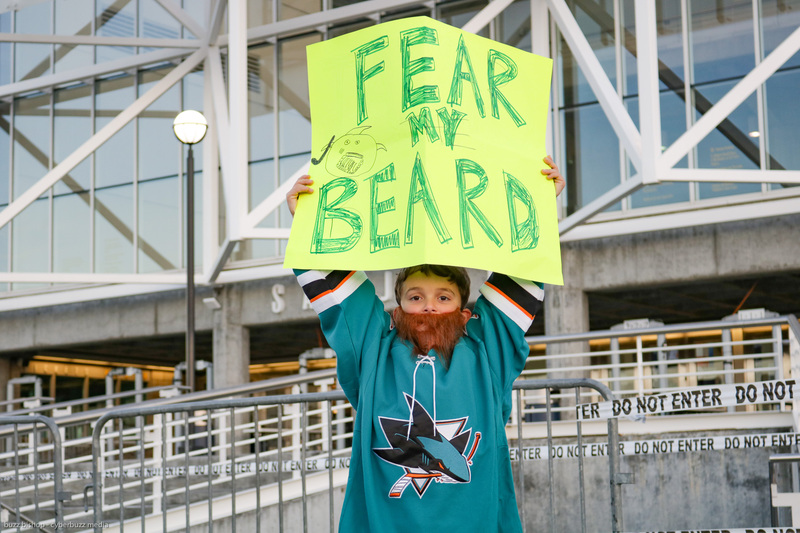 A kid a few seats over from us was wearing a San Jose Sharks jersey and a big fake beard. The players spotted him quickly and 2 of them flipped him pucks over the glass. I urged Charlie to stay by the glass, but he only had ‘a shirt with Sharks on it’, not a real SJ Sharks jersey. The other kid was younger = thereby cuter – and Choochie didn’t get a puck. Downtrodden, we headed out to the concourse to get a hot dog and some ice cream before taking our seats. The Sharks scored quickly, and hopped out to a 2-1 lead after the first period. Charlie was having fun – and then he crashed. We had gone to the game too early, it had started too late, and just as the first intermission was coming to an end, he asked to go home. Fair enough. We listened to the 2nd period in the car on the way home, and he crashed into bed upon arrival. Zacharie’s hockey night went a little better. First off, it was an earlier puck drop, of 7p, and now I knew that warmup happens 25 minutes or so before the game, so we weren’t there as early. A holdover from our days in Vancouver, and my cheering for the Canucks, he thinks it’s pretty cool that ‘berto now plays for ‘his’ favorite team. Like his brother before him, Zacharie stood dutifully by the glass, waiting for a player to recognize a familiar logo in an opposing arena. 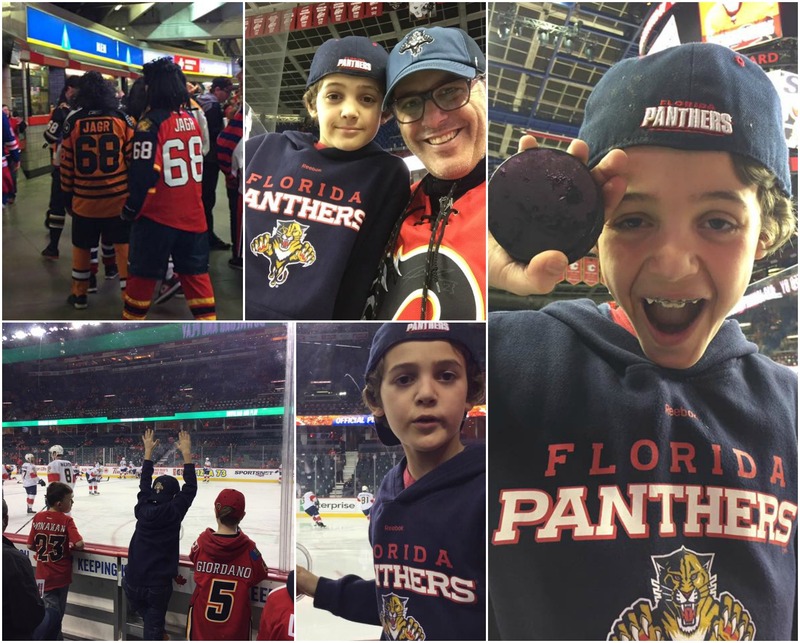 Finally, surrounded by kids wearing Flames jerseys, Reilly Smith spotted Zacharie’s Panthers hat and hoodie and flipped a puck over the glass too him. The smile was huge and instant. We grabbed the requisite ice cream and hot dog (I swear my kids love arena snacks and Zambonis more than hockey) and went up to our seats. Zacharie complained we had ‘nose bleeds’ and pointed to all the empty seats in the lower bowl. 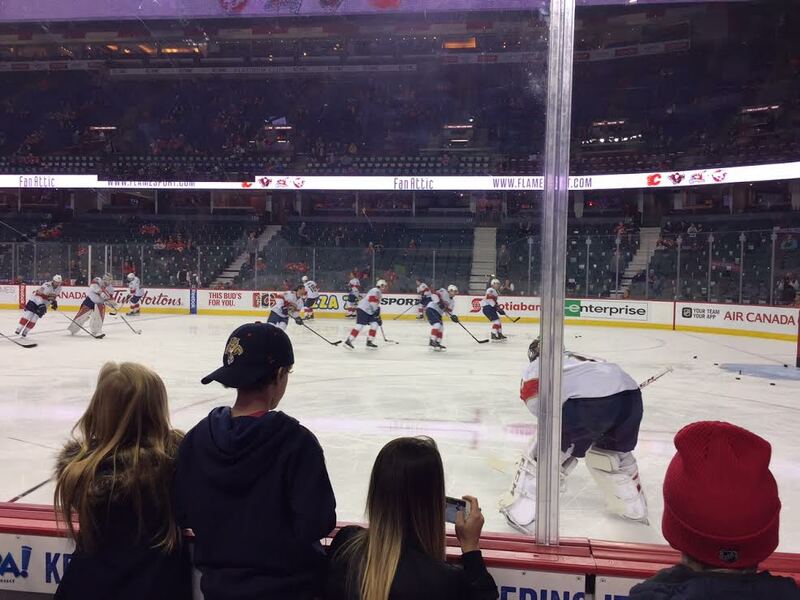 At first intermission we snuck into the last row of the lower bowl and got an up close look at the Flames raging through a 2nd period comeback. Zacharie was determined to stay to the end, but when the Flames scored to make it 5-2 halfway through the third, I convinced him we could listen to the rest of the game in the car on the way home. 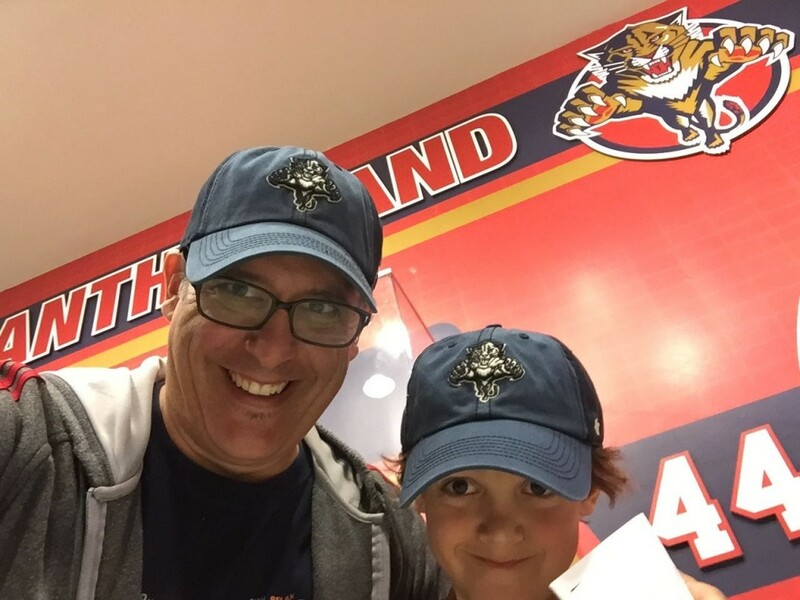 As we held hands walking out of the arena, he in his Panthers gear, me decked out in Flames, he whispered a quiet thank you for taking him out. That’s it. That’s it right there. 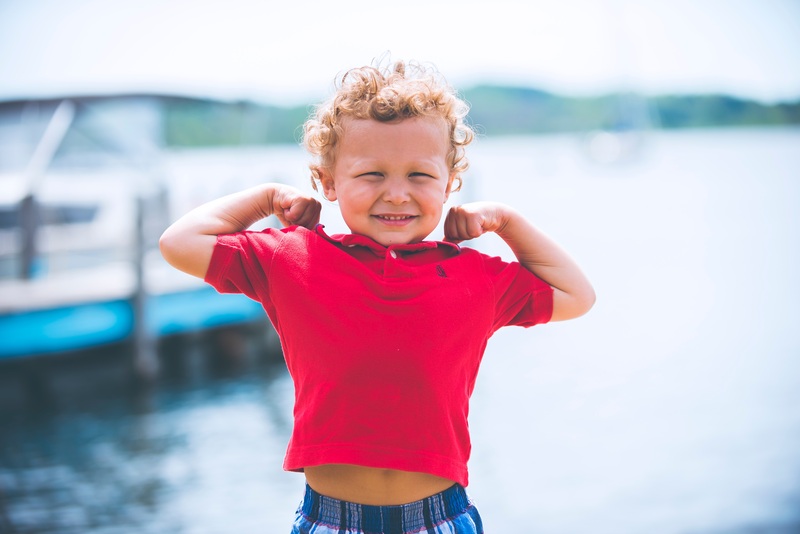 My kids have had so many opportunities to do cool things in their young lives, and when they recognize and appreciate their good fortune, I am so proud. And want to give them more opportunities and adventures. I’ve now made a promise to each son that this night out will become “our thing,” just like it was a thing for me when I was a kid. 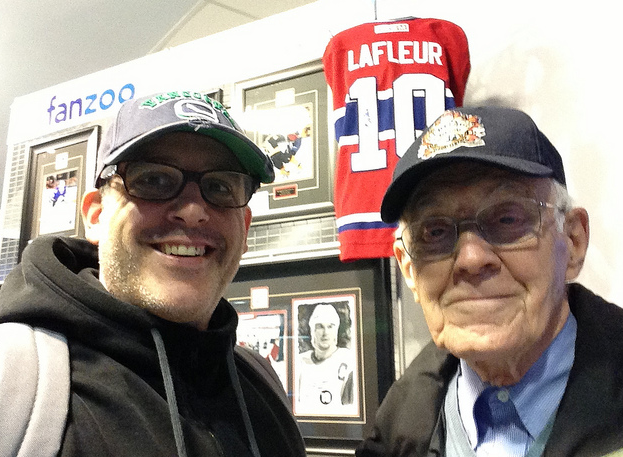 I saw my first NHL game when I was 9, about the same age Zacharie is now, and it became my favourite thing ever – to see the Montreal Canadians with my grandfather. We’d take the train, have Chinese food, and cheer on Dryden, Robinson, and Lafleur. It’s a tradition I continued when I was an adult with him and we lived in Vancouver. So now, with my boys I will substitute a hot dog and ice cream for Chinese food, the Sharks and Panthers for the Canadians and Canucks, but the magic of time together will continue. 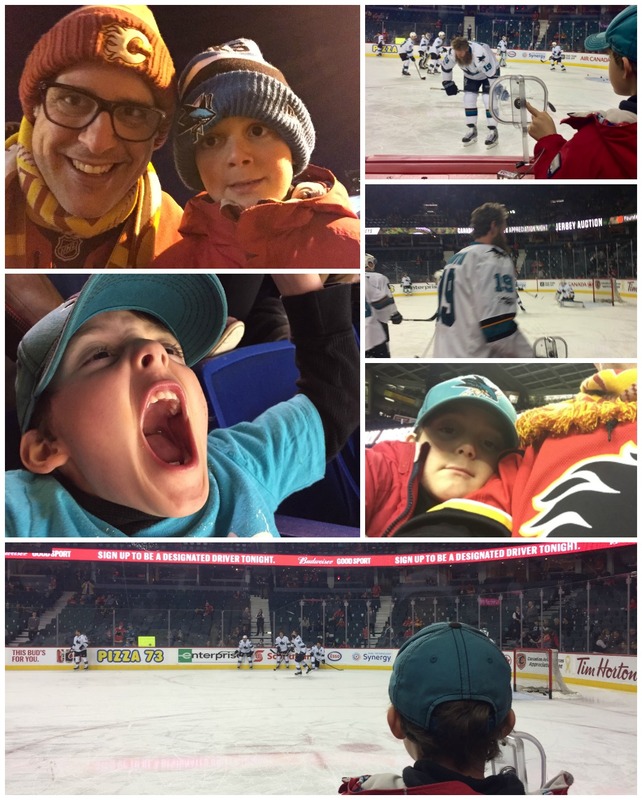 Each year, when their favourite team comes to town, we’ll get tickets, go early, try and get a pick from Big Joe or Berto while daddy hopes the home team wins. 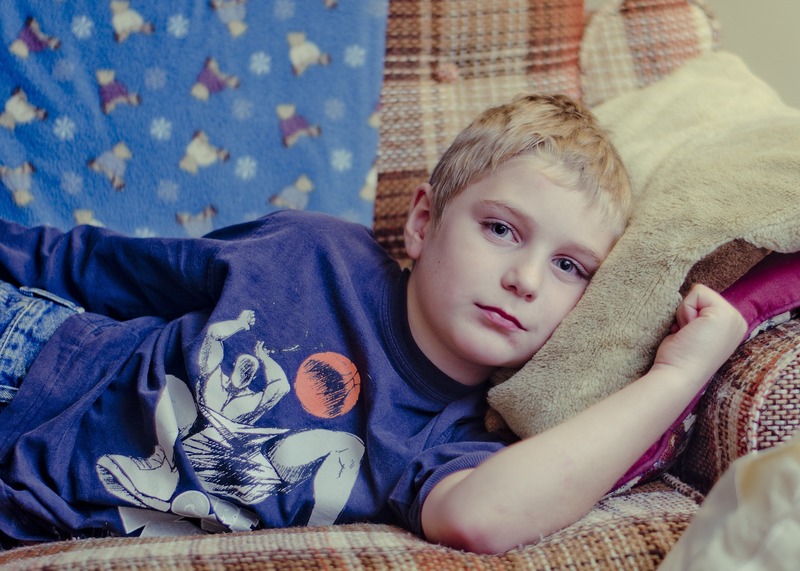 How Sick Does Your Kid Have to Be to Miss School?